Digital Missions are a series of trade missions organised by Chinwag. Over the past 6 years, 12 missions have helped over 220 companies expand internationally, understand foreign markets, attract investment, find partners and develop business relationships. This Digital Mission to China (Shenzhen Maker Faire), 4-11 Apr 2014, brings together the UK’s leading ‘makers’ - creative technologists and entrepreneurs combining 3D printing, Internet of Things, open source software and crowdfunding to revolutionise manufacturing - on a specially designed week-long trip centered around the Shenzhen Maker Faire. The trip includes market briefing, company visits, networking events and access to the UK stand at the Maker Faire. Travel grants for qualifying SMEs are available from UK Trade & Investment. The Digital Mission is to New York (17-21 Feb 2014) took place to coincide with Social Media Week New York. Chinwag’s Digital Mission 2014 included an exciting programme of tailor made events, workshops and meetings, designed around you and your business’s needs. 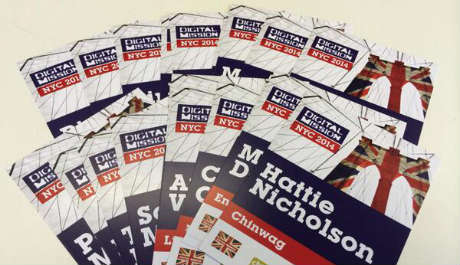 See the pages below to find out more about the Digital Mission to NYC 2014. Don't forget to follow us: @digitalmission, +DigitalMission and our email newsletter for future trips. Over the course of the Digital Mission trips and one UKTI Mission, the UK's leading digital firms have taken part, representing the cream of the UK's tech scene. To keep up-to-date with the Digital Mission and other opportunities for overseas expansion, sign-up for the Digital Mission newsletter, or follow @digitalmission on Twitter. You can also follow @digitalmission on Twitter, Facebook and Linkedin. The Digital Missions are only possible with the generous support of both public and private sector organisations. The aim is to make the trips as affordable as possible for the SMEs taking part. There's a different line-up of supporters for each trip - please see the mission pages - we'd also like to thank UK Trade & Investment, Winston & Strawn, Codeworks, TechFluff TV, Seedcamp, The Next Web, Momo London amongst many others who've supported the series. If you're interested in getting involved with the missions as a host, a partner or sponsor, drop us a line mission chinwag [dot] com or call +44 7480 137465.